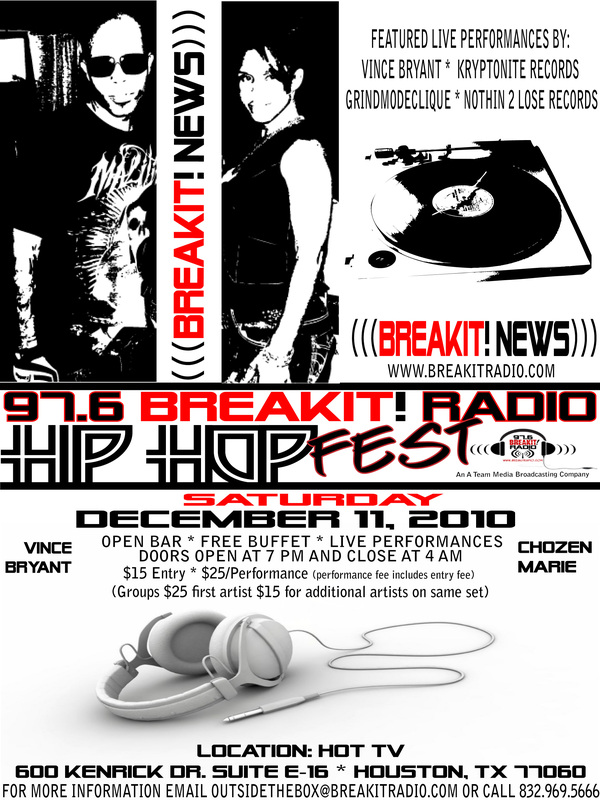 SATURDAY, JANUARY 15, 2010, AT 7:00 PM, 97.6 BREAKIT! RADIO WILL HOST THE OFFICIAL LIVE STREAMED HIP HOP SHOW AT HOT TV, LOCATED AT 600 KENRICK DRIVE, SUITE E-16, HOUSTON, TX 77060. BreakIt! Radio invites the community out to enjoy Independent Artists as they break their talent on the HOT TV stage as we stream them live before the world and special guest A&Rs from major labels. 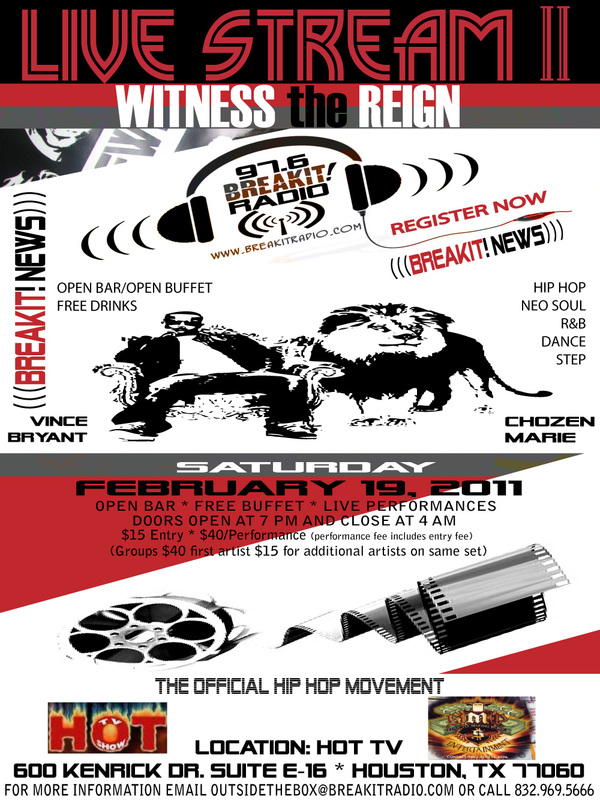 On January 15, 2011, 97.6 BreakIt! Radio will be kicking off another hot event to ever hit the Houston scene supporting Independent Artists in the Gulf Coast Region. They will be the first in this industry to stream a live show directly to A&R contacts at the majors! 97.6 made HOT TV their home for hosting events that will help Indie Artists gain exposure and advance their careers. The station owners, Vanessa Chozen Marie and Vince Bryant, contend, and it shows, this organization does not put on mere showcases; they actually assist artists in promoting themselves and breaking them into the industry through promotions, giving them radio play and by providing artists and record labels with proper tools and advice to take them to the next level. The 97.6 BreakIt! Radio HIP HOP FEST is sponsored by Signature Drinks (a sassy yet classy ladies bartending service), One21Ten (Deejay and sound services), Real McCoy Entertainment (RME), B.MICHAVERY MANAGEMENT (Big Money Kingz), Signature Drinks and Strictly Making Paper Entertainment (S.M.P.). There will be powerful special guest performances by Vince, Most’Wanted Bryant, Real McCoy Entertainment, Big Money Kingz and B-Dub of Strictly Making Paper Entertainment. There will be a super Hip Hop mix provided by Gene Bogany of One21Ten. In this defining moment when African American-owned media, entertainment and broadcasting companies are making history in Houston and the Gulf Coast Region, the owner of HOT TV (Houston’s Own Talent), Malik Rasheed, who has been a pillar in the community for surrounding artists has now moved the HOT TV Show to Channel 21 (UTN – Urban Television Network), an African American-owned TV network. 97.6 BreakIt! 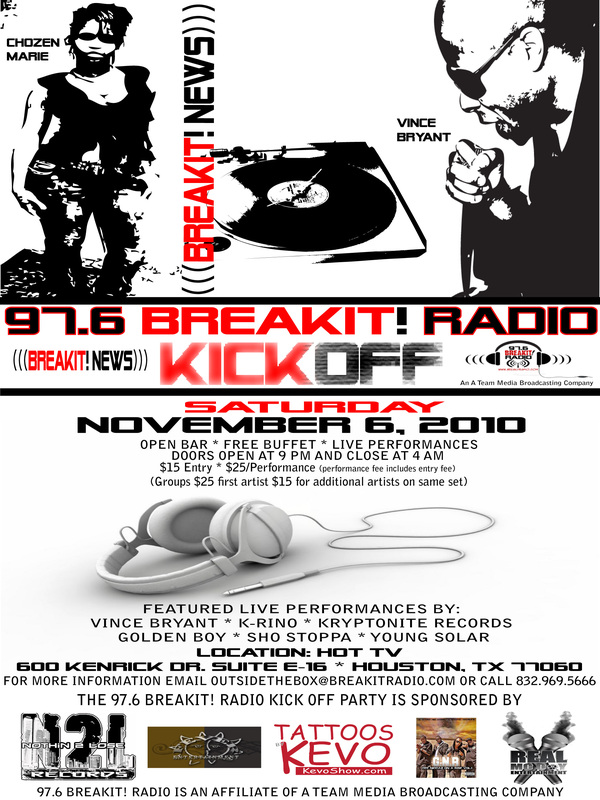 Radio is proud to be a part of this historical moment, hosting the 97.6 BreakIt! Radio Live Streamed Hip Hop Show at the very home that has been an avenue since 1999 for Houston artists to gain exposure. 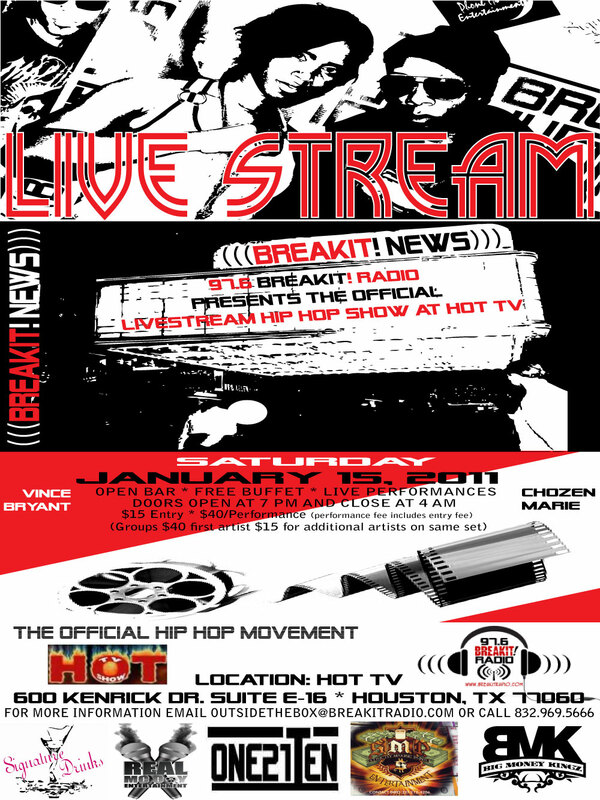 For more information regarding the Live Streamed Hip Hop Show, contact (832) 969-5666 or email outsidethebox@breakitradio.com. To become an event sponsor, vendor or to advertise your business at this event, contact Vanessa Chozen Marie at (832) 969-5666.